As many as 50 million Americans have some sort of allergy, many of which are to substances found in their own homes. In fact, research published in the Journal of Allergy and Clinical Immunology found that at least six allergens were discovered in 51.5% of the homes tested. Common indoor allergens, which affect both the eyes and nasal passages, include dust mites, mold and mildew, cockroach droppings and pet dander. Of course, pollens from trees and grass can sneak into the home too, as can the spores from outdoor mold. These irritants cause some unpleasant side effects – including a stuffy head, streaming or itchy eyes and a scratchy or sore throat. While medication – or natural treatments – may help you breathe easier, removing or reducing your exposure to the allergen is the best way to manage this condition. Where possible, remove soft furnishings throughout the home as these gather dust and provide the perfect breeding ground for dust mites. This is especially true when it comes to your bed, with an average mattress containing between 100,000 and 10 million bugs, leaving several million droppings – a pretty unpleasant thought! Wash bedding weekly and other soft furnishings monthly at 130 to 140 degrees F to kill the mites. Research has found that adding a few drops of eucalyptus essential oil to the wash will eliminate 99% of dust mites from your bedding. After they have been cleaned, encase the mattress, duvet and pillows in mite-proof covers. To cut down on some of this work, consider reducing the amount of ornamental cushions and throws and removing padded headboards in the bedroom. Why not replace your fabric headboard with a stylish DIY pallet board instead? You’ll find out how to here. Swapping curtains with blinds and carpets with wooden floors are also good ideas. Finally, avoid wool blankets and down quilts which can be troublesome for many asthma and allergy sufferers. Dust once or twice a week with a wet cloth (this helps avoid spreading mites over the room). Make sure to wipe down all surfaces thoroughly and then wash the cloth at a high heat or throw it out. While there are many sprays on the market for killing dust mites, and reducing other allergens, these are often ineffective and expensive. Try making your own dusting spray using tea tree oil – with antibacterial, antiviral and antifungal properties it will not only eliminate dust mites, but allergy-inducing bacteria, viruses and fungi too. Simply blend two cups of distilled water with two teaspoons of tea tree oil and decant into a dark spray bottle. Use it regularly to dust, or spray your upholstery and carpets, and you should soon feel some relief from symptoms! Don’t forget to shake before each use to distribute the oil. Many chemicals and toxins used in conventional cleaning products can trigger or intensify allergy and asthma symptoms. A recent study even found that products like bleach, glass cleaner, detergents and air fresheners exacerbated asthma-related symptoms in women, leading to reduced lung function until the morning after exposure, in some cases getting worse with time! And two Australian studies show that many common household cleaners release toxins into the air which can increase the risk of asthma in children. Look after your health by choosing green cleaning products with natural and plant-based ingredients. Or, better yet, make your own. Here are 40 green cleaning tips to get your house sparkling from top to bottom! Vacuum twice a week focusing on the areas that accumulate most dust – such as under the bed and near entryways. If you don’t already have one, invest in a vacuum cleaner with a HEPA filter, which captures tiny particles rather than sending them back into the air. Because vacuuming (and dusting) stir up dust, wear a mask when cleaning or ask someone without allergies to clean for you! While dry vacuuming removes the dust upon which mites feed, it has been found to be ineffective at removing the mites themselves from carpeting. This is why regular steam cleaning of rugs and carpets is important for allergy sufferers. Don’t forget to vacuum and steam upholstery, drapes, rugs and other soft furnishings regularly too. Along with dust mites, cockroaches and other pests need to be eliminated as their droppings can trigger allergies in some. As chemicals also exacerbate allergies, natural is best when it comes to getting rid of household invaders. To deter cockroaches and rodents, store all food in tightly sealed containers and remove food waste from the house regularly. Try leaving bay leaves around the area where roaches frequent – the scent should ensure they scuttle out of your home as fast as their legs can carry them! Another option is to spray a solution of cayenne pepper powder, garlic, onion and water when you see them. Bait and traps are more chemical-free methods to eliminate cockroaches and their allergenic droppings. Diatomaceous earth (DE) is yet another safe and effective way to kill both roaches and dust mites. Sprinkle it in areas where roaches congregate, especially on cabinet tops and behind appliances. Do this twice a week for two weeks and your infestation should be gone. To kill mites, treat your carpets and rugs to a regular dusting of DE. Learn more about using diatomaceous earth here. Swapping your shoes for snug slippers once you get in the door from work doesn’t just provide relief to your aching feet – it may also help cut down on your allergy symptoms. The greatest concentration of household dust is found in carpeting near the entryway, with up to 40% of contaminants in the home being brought in from outdoors! Those initial few steps inside matter – with the first four bringing in 85% of these foreign contaminants. For maximum impact, place doormats by every exterior door – leaving a grate-like scraping mat outside the main door which you can use to remove most of the contaminants and an absorbent doormat inside to trap additional foreign material. Then slip on comfortable indoor shoes and relax – knowing you are cutting down on both allergens and cleaning time! Luckily, by taking a few measures, you can happily live with your pets without sneezing every time they wander into the room. Designate a particular area of your home for your pet – and never allow them into your bedroom. If possible, ensure you pet’s quarters are easy to clean, and have little soft furnishings. Consider investing in a specialized HEPA filter to clear pet allergens from the air. One study found that this filter reduced dog allergens in the air by 90% when the dog was not in the room and 75% when it was! Pet owners should also be extra-diligent about following some of the other suggestions outlined in this post – including vacuuming regularly with a HEPA filter, washing soft furnishings at a high heat and wet-dusting. Another way to reduce dog allergens is to bathe your mutt regularly – twice a week is best. A 1999 study found that a bath reduced the dogs’ allergen levels by about 85%, with effects lasting for three days. Here are five natural dog shampoo recipes to try. Clearing clutter from your home is one of the Mayo Clinic’s tips for reducing symptoms of allergy and asthma. They recommend removing items that collect dust – like tabletop ornaments, knick-knacks and books, and storing kids’ toys and stuffed animals in plastic bins. Here are 31 minimalist hacks to help de-clutter your life in just one month. While opening up your windows is a great way to raise the vibrations of your home and let more oxygen in, it’s also a surefire way to bring irritating pollen in too! For many, this isn’t an issue but for allergy sufferers it can cause untold misery. During pollen season, make sure to close your windows and doors. Using an air conditioner in your car can cut the amount of pollen you breathe by as much as 30%! If you or your family members are out in times of high pollen (the morning or early afternoon), it’s a good idea to change clothing and shower upon returning to the house, keeping contamination to a minimum. Finding the perfect temperature and humidity level is key to allergy control. Keep your house nice and dry – switch on your dehumidifier if necessary. Dust mites thrive when humidity is greater than 50%. Below this, their actions are inhibited. Mold also requires moisture. The American Lung Association recommends opening your windows for one hour per day on dry days to help remove humidity from the house. Naturally, you’ll want to check the pollen forecast first. On the other hand, if the humidity dips too low, certain allergen particles are more likely to circulate in the air! For this reason, a temperature of between 68 F and 72 F with a humidity of 40% is optimal – employ these 10 clever ways to naturally humidify the air if necessary. Mold loves damp areas – the bathroom, basement and kitchen are all ideal areas for mold growth. These spores float in the air and trigger a whole range of allergy symptoms, along with sinus infections and skin irritation. Thankfully, there are a number of ways to reduce mold spores. Fix leaks, run ventilation fans, open windows if safe to do so, and switch on the dehumidifier. If you do see mold, employ the powers of natural fungicides like tea tree oil, ethanol and vinegar to curb growth. 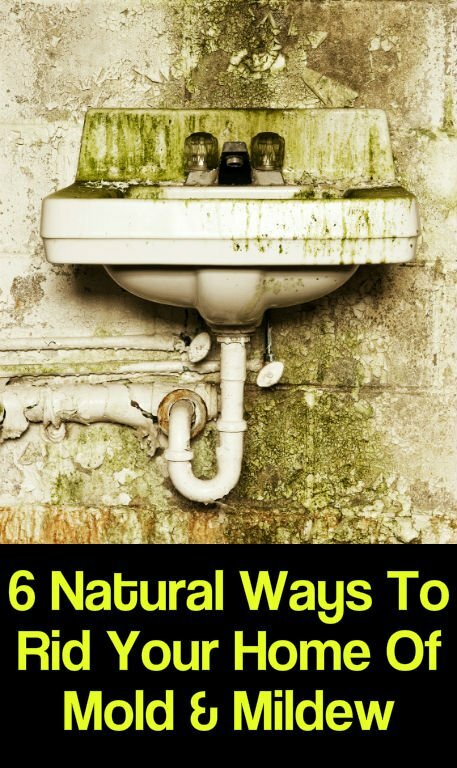 This article details six natural ways to rid your home of mold and mildew. Those who suffer from pollen allergies may think all houseplants are off limits to them. But certain plants can actually collect pollen and pollutants in their leaves, helping to clean the air in your home. Some of the best purifying plants include Peace Lilies, Golden Pothos, Philodendron, Gerbera Daisies, Areca Palm, Bamboo Palm and Dracaena. Some of these as plants have already been listed among our top 13 picks of air-purifying plants. As a bonus, many even help you sleep at night! No matter what variety of houseplant you choose, you should be aware that plants attract dust, and therefore dust mites. To remedy this, simply wipe the leaves with a damp cloth on a regular basis. In addition, the moist soil around houseplants presents the ideal place for mold to thrive. To prevent mold growth, water only when the soil is dry and just moisten, don’t saturate, it. While many experts recommend employing other interventions first – like those outlined above – they say that if you are still suffering from indoor allergens, then investing in an air purifier may be worthwhile. Always choose one with a HEPA filter, which removes 90% of allergens, and clean the filters regularly. Remember to close windows and doors in the room where you are using your purifier as it will be rendered ineffective otherwise! This GermGuardian 3 in 1 Air Cleaning System is regarded as the best.